Berlin and Wolfenbüttel, 23rd August 2014 – Plaintel GmbH, Provider of the well-known Askozia PBX, and beroNet GmbH, Europe's leading manufacturer of VoIP-Access Technologies, have announced recently their collaboration in form of a strategic Technology Partnership. 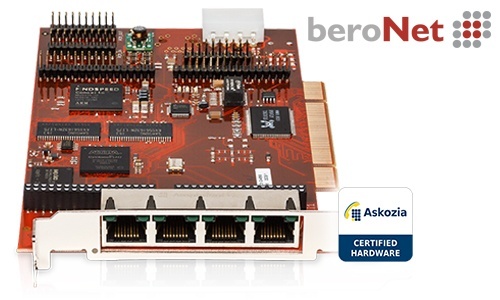 The PCI cards of beroNet will be integrated by default into the new Askozia Telephony Appliance. It's been a long time that the PBX provider Askozia is very satisfied with the high quality of the beroNet PCI Cards. During the development of the new Askozia Telephony Appliance, exhaustive tests showed, that the beroNet PCI cards had the best performance compared to other manufacturers. The simple implementation and the trouble-free integration into the Askozia Appliance have convinced the CEO of Askozia, Sebastian Kaiser, to embed the beroNet PCI Cards by default into the new Appliances. “The most important factor while developing the new Askozia Appliance was the uncompromising quality of all components. Only the beroNet PCI Cards could meet this high requirements.” explains Sebastian Kaiser, CEO of Askozia. “We are very satisfied, that we where able to enlarge the already existing Partnership with Askozia. It's been a long time that beroNet Products are compatible with the AskoziaPBX. Most recently all beroNet Cards and Gateways can be auto configured directly within the AskoziaPBX-Webinterface since the newest AskoziaPBX Version. The fact that our PCI Cards had the best performance compared to other manufacturers proves once again, that we are on the right track in developing the beroNet products.”, adds Christian Richter, CEO of beroNet. Need help to find a beroNet product that perfectly fits your needs? The VoIP Experts from beroNet are glad to help! Since 2000 Christian – who originally studied Physics – has been designing software for telecommunication solutions. Reaching from ISDN to SIP he has strong knowledge and extensive experience in telecommunications protocols, which allows him to always come up with new ideas and communicate creatively with our customers. Christian is the CEO and a co-founder of beroNet GmbH.